Just 4 Fun Carnival Band was started six years ago by Rostan Taylor and Perry Mason. This year Andy Delmar and Veil Tobierre manage the band. Just 4 Fun is all about jumping 'Just 4 Fun!' The goal is for all its revelers to have great costumes, in addition to a fantastic and safe St.Lucian carnival experience. 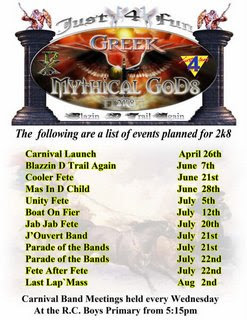 The 2008 Just 4 Fun Carnival Theme is Greek Mythical Gods. Click here to view, Just 4 Fun's 2008 Female Costumes. Just 4 Fun is an all inclusive band with some Just 4 Fun pre-carnival season fetes that are free. The Just 4 Fun experience ranges between EC$450-$475, while the VIP experience is EC$700. There are about 700 revelers in this band, spread out among 7 sections. The Just 4 Fun reveler knows how to have a good time. Just 4 Fun Carnival Band is most known for its Cooler Fete and Blue Devils. The band's main sponsors are Piton Beer, Bmobile & Fruta Max.